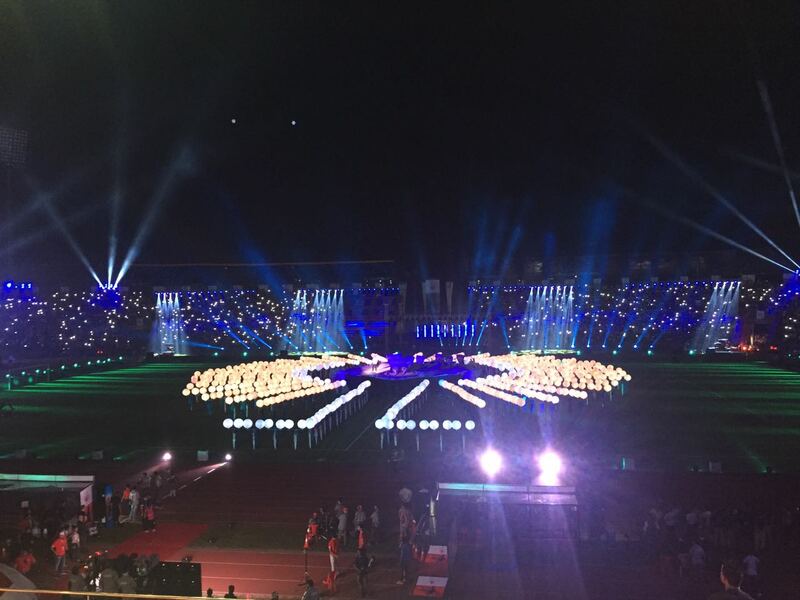 This was the 3rd edition of the Hero Indian Super League’s Opening Ceremony and Showtime’s second on the trot. Appointed by FSDL, Star Sports and Reliance-IMG, Showtime was entrusted by bringing India’s passion for football to life and Guwahati responded with a packed house - more than 35000 fans of football converging at the Indira Gandhi stadium to witness an experience that set the mood for the start of the tournament. Swamp Soccer India: a spectacle or sport? While protocol-related mandatories were to be addressed with due diligence yet appropriate and adequate expression to the core thought had to be given– fun and unparalleled entertainment for the spectators of ‘the beautiful game - 35000 of them in stadia and millions of football fans across four continents to whom the ceremony was broadcast live. So, technology it had to be. Yet, it had to be weaved into a cogent and an emotionally powerful story spiced with regional flavours that was told in a manner that would stir the spectators. And Showtime did exactly that. The Field Of Play is central to a Sporting Ceremony and therefore it is imperative to use it to showcase the event. However, the FOP is a sacrosanct space that simply cannot be intruded upon in any manner whatsoever especially when there is to be 90 minutes of football on that FoP immediately proceeding the ceremony complicated further by the forecast of rain. Showtime came up with the novel idea of driving in and erecting a mobile stage at the center of the FoP. The agency’s technical team in conjunction with the league’s pitch experts designed a drivable aluminum and wood paneled circular stage that sat atop the only permissible equipment on the field – Hydro Super Soppers. The stage drove in 15 minutes before the ceremony was to begin and drove out as soon as the ceremony was done leaving in its wake a perfectly protected football pitch ready for a football match. Every element and every segment, be it the protocol deliveries like the pledge-taking, introduction of the ceremonial match ball or the other indulgent showcases were carefully detailed out. A suspense voice-over countdown welcomed the crowd with announcements every fifteen minutes, starting an hour before the show. The climax was visibly built up by the time the moment of reckoning arrived. A musically inspired digital pixel enabled mass cast countdown brought the pitch to life and had the crowdalready roaring when Jacqueline Fernandez blitzed the stage with a riveting Bollywood dance sequence. And as it came to a finish, came the next snapdragon. North East FC United owner John Abraham rode in on an ATV with a brigade of bikers from the North East. The owner of the defending champions Abhishek Bachchan followed next with the tournament trophy even as the pathway to the stage lit up to sheer brilliance while he walked up. The pricelessness of the trophy, presented in a priceless fashion. An inimitable star cast – John, Abhishek Bachchan, M. S. Dhoni and master blaster Sachin Tendulkar took to the stage to introduce the leading teams and take the ceremonial pledge before Alia Bhatt fired the stage with her performance. And then the other mandatory protocol – the HISL Anthem “Let’s Football” – was enlivened by Varun Dhawan, Alia Bhatt and Jacqueline on the stage. Even as the star cast was in full bloom, technology had a ball, with PixMob creating a rstunning radio-frequency driven kinetic lighting sequence that transformed the Field of Play into a mélange of crazy, colorful and unimaginable magic. There were several other classic moments in the story. Several rounds of fantastic fireworks above the stadium, cold pyro bursts on the perimeter of the stage, Sachin’s entry on a motorized glowing neon elephant symbolizing the Kerala Blasters FC logo. Pixel cast act with varying lighting effects depicting graphic equalizers during Alia’s performance. Drums of North East sequence on stage that echoed the beats of the region. And in culmination, the pixel cast opening metallic umbrellas that formed the map of India to perfect precision and become the surface for a Projection film on the revolution in Indian Football brought on by the Hero Indian Super League. The Map of India then burst to life with the magnificent colors of the Hero ISL’s colors to form the backdrop for a perfect Selfie moment for all the Stars on stage with the league chairperson Mrs. Nita Ambani. With the ceremony complete it was now time for a solemn rendition of the National Anthem by Shillong Chamber Choir as a fitting finale to salute a nation of avid footballers.